Florence + The Machine showed no signs of being intimidated opening for megastars U2 in front of a stadium filled with people who'd never heard of them in Nashville last night. The celebrated British band made themselves a hard act to follow, performing seven songs from their acclaimed debut and one slated for the followup. The highlight of the show came early as they launched into a spirited "Drumming Song." It's my favorite track on Lungs and despite the heavy use of electronic elements, it came off well onstage. That's perhaps the biggest, most pleasant surprise about Florence + The Machine last night. Their songs are well-produced pieces of music that rely on the studio as an instrument. I wasn't sure they had it in them to deliver live, and then to pull it off in a stadium. They did both. 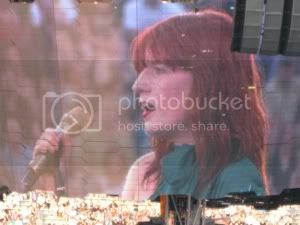 Stadiums probably aren't the best place to see them but they didn't let that hinder them, as Florence worked the stage and even sprinted a lap around the massive outer ring of U2's stage, already placed for the headliners. The crowd was civil to these newcomers with whom they were unfamiliar and many even seemed to warm up to them by the end, "Rabbit Heart (Raise It Up)" and "Dog Days Are Over" drawing enthusiastic responses. I am now completely won over by them on record and in person and hope to one day see them in a room that plays more to their strengths and allows them a longer set. I waited ages to buy Lungs; I won't be waiting a single day for its follow-up.